For a couple of weeks now, I’ve been allowed to breeze through airport security. No literally bending over backward to futz with shoes, jackets and laptop computers. Or losing driver’s licenses — which actually happened to me once when I wasn’t paying attention. Far from celebrity treatment, but I felt pretty special anyway. I thought it might have had something to do with my frequent flyer credit card. Whatever. It was such a relief. But the other day, that magic code was missing from my boarding pass. Back to the reality of being ordinary. What a comedown. I’m in the process of finding out what this is all about. 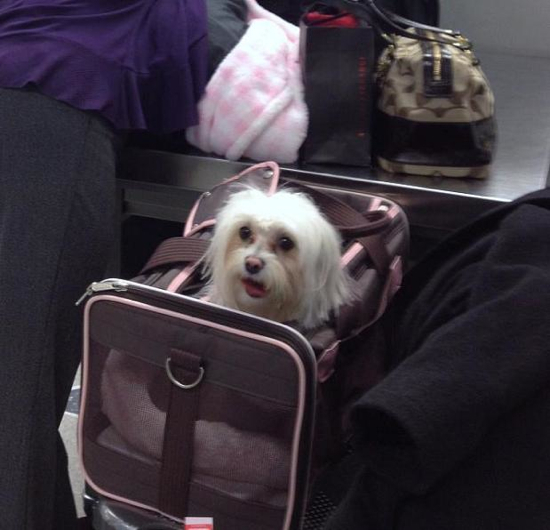 This entry was posted in At the airport and tagged airport security, dogs who travel, TSA, TSA Precheck. Bookmark the permalink.